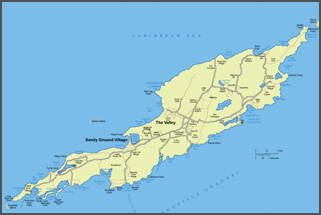 Anguilla is the northern most island in the north/south group of Caribbean islands that form the Leeward/Windward chain. It is located just north of Sint Maarten/St. Martin and just east of the British Virgin Islands. It’s approximately 16 miles long and about 3 miles wide. Anguilla’s main business is its tourist industry. However, it doesn’t resemble the tourist industry of most Caribbean islands. No large cruise ships make port in Anguilla and no casinos are allowed on the island. And although there’s a restaurant in the island’s capital, The Valley, that displays the Subway logo, it’s the only place approximating a fast food chain you’ll find. The benefit of all this is that Anguilla has a reputation as an island where the lifestyle is private, quiet and low-key. The people are extremely friendly and crime is extremely rare. Many of the celebrities who come to Anguilla are known to leave their bodyguards at home! In addition to the above, what attracted the owners to Anguilla were the collection of over 100 restaurants and the presence of 33 of the most beautiful beaches in the world. In 2017, Anguilla was named Travel+Leisure World’s “Best Island in the Caribbean, Bahamas & Bermuda” destination. The best way to get to Anguilla from the U.S. is to fly to St. Maarten. From there you can either take a private water taxi from a dock just a few blocks from the airport or take a taxi to the public ferry dock in the town of Marigot on the French side of the island. The private boat costs roughly $60 - $70 for a one-way trip and the public ferry costs $20 for a one-way trip plus a departure tax of $6. The trip takes between 20 – 25 minutes and the public ferry leaves every 45 minutes from 8:15 AM to 7:00 PM. Once you arrive in Anguilla, you will be asked for a completed Customs and Immigration form, you will be interviewed by a Customs officer and then your baggage will be inspected. When that process is completed, simply walk outside to the taxi stand and catch a waiting cab. Fleur de Sel is located on Long Path Road about 3 kms. from the main traffic light in The Valley, just a block west and a block south of Best Buy Market. Homes in Anguilla don’t have addresses, so just look for the bright yellow villa and that will mark the spot! Dress on Anguilla is very casual…shorts and blouse/short-sleeved shirt, khakis, sandals – not much else is needed. Most people wear cover-ups over their bathing suits, particularly if they are dining at a beach restaurant or shopping in the retail stores. For dinner, especially in any of the nicer restaurants, women might be more comfortable wearing white or black slacks or a skirt and a blouse. Neither ties nor sport jackets are at all necessary. Many visitors are concerned about driving on the island. It’s not that difficult. The most important thing to remember is KEEP TO THE LEFT! With the possible exception of the handful of traffic circles called “roundabouts”, this “driving on the wrong side” comes quickly. When it comes to the roundabouts, just take your time and adjust your thinking to CARS IN THE CIRCLE HAVE THE RIGHT OF WAY. So, if a car is coming into the circle at the same time as you and it is on your right, that car has the right of way. As you approach a roundabout, if you plan to go left, get in the left lane and signal your left turn. Look to see if there is a car coming from the right. If not, you can proceed. Unless otherwise marked, the speed limit on the island is 30 MPH. However, your speedometer might be in KPH, so be careful. At night, many Anguillans drive with their high beams on, so be cautious and drive slowly. There’s rarely a need to be in a hurry. IT’S GENERALLY A GOOD IDEA NOT TO TRY TO PASS! Compounding the challenge, many pedestrians walk with their back to the road and they can be difficult to see. The best advice is to be careful about where you are relative to the middle and edge of the road. Last, but not least, there are a handful of stoplights on the island. It is not legal to turn on red. Renting a car is a very good idea. They generally cost around $35 per day plus $5 per day for the highly recommended insurance. You will need to obtain a temporary driver’s license. The cost is $15 for a 72-hour license and $25 for a three-month license. You will need to be able to show your home license. The villa owners will be happy to make arrangements and they highly recommend Junie’s Car Rental. Veya – located on the road down to Sandy Ground just beyond a roundabout at the top of a hill. It’s a lovely location boasting open air and an abundance of flowers. There are actually two restaurants – a formal upstairs dining area and a Moroccan-themed tented lounge called Meze. The latter offers an assortment of tapas and diners can also order from the main menu. There’s music in one place or the other most nights. Reservations for the upscale restaurant border on mandatory. SandBar – This is arguably one of the best values on the island. It serves tapas and small plates and an extensive list of drinks and wines. It is situated right on the beach at Sandy Ground and is just a fun place for a lighter dinner (or you can eat a lot and be very full!). Reasonably priced. Reservations are advisable. Dolce Vita – also on Sandy Ground is popular and always packed. Food is very good Italian, albeit somewhat pricey. Great location. Owner has a bit of an attitude. Johnno’s – This is a Sunday afternoon gathering spot for many expats and the sailors who are moored in the adjacent harbor. Johnno’s isn’t particularly about the food (though the hamburger and fish sandwich are quite good). Rather, it’s the live jazz that’s the draw. Typically, the music plays from around noon to 3 PM. Trattoria Tremonto (Shoal Bay West) – This wonderful Italian spot is located at the far western tip of the island. The food is uniformly fresh and delicious. TT is the perfect place to while away a day sitting under the palm trees, gazing across the azure blue water at St. Maarten, sipping a luscious rosé and enjoying the varied recorded song lists. If you want to score a lounge chair, you need to get there early. Jacala (Meads Bay) – This is considered by many to be the most “gourmet” dining experience on the island. A French menu with the requisite French attitude and chère prices is the order of the day here. Depending on where you get seated, the setting is quite lovely. Straw Hat (Meads Bay) – This is a very pretty restaurant located right on the beach at the Frangipani resort. The menu features small plates and mains. Blanchard’s (Meads Bay) – This was once THE place to see and be seen Anguilla. It’s also the subject of a popular book called “A Trip to the Beach: Living on Island Time in Anguilla”. If you’re into celebrity spotting, Blanchard’s remains a good bet. The food is generally well-prepared, albeit not inexpensive. Blanchard’s Beach Shack - This popular outdoor food fest is located next door to its namesake and one of the best bargains to be found. The menu is a catch-all comprising everything from fish tacos and BBQ pork sandwiches to salads and meals in a bowl. BBS is the epitome of a great beach shack experience. Mango’s (Barnes Bay) – This features among the freshest and widest assortment of fish to be found. Four Seasons – Upscale and contemporary resort at the west end of Meads Bay. Great place to go for a drink at sunset to watch for a “green flash”. Malliouhana – One of the oldest resorts on the island, this beautiful compound recently reopened after a two-year renovation. Perched on a hill overlooking Meads Bay and facing west, it’s also a great place for a drink at sunset. Da’Vida – This beachfront al fresco option is located just north of the Valley down a steep hill to Crocus Bay. There’s a beach bar/restaurant for lunch and a broad menu, full-service facility that includes tapas for dinner. Village BakeHouse – A recent addition to the dining scene, this charming occupant of the one-time Koal Keel building features the most delicious and widest assortment of pastries, baked goods and sandwiches on the island. Tropical Sunset – If you want to sample some great local cuisine – conch, ribs, goat and fresh fish among the best examples – as well as a perfect place to hang for an idle afternoon on this top-rated beach, Tropical Sunset is the perfect place. Hibernia – is located east of Island Harbor on the north side of the island. The French-Thai food at this tranquil, well-designed classic in Island Harbor, is both unique and superlative. There is also an Asian influenced art gallery on the property. Smokey’s – This is a great place to go for fresh island fare and live music. Falcon’s Nest – This soulful beach shack in Island Harbor has a growing reputation for its value-priced menu of lobster, fish and burgers. Cha Cha San - When the craving for Asian food strikes, this modest establishment alongside the main road west from the Valley is the place to go. The menu lists a variety of creative small plates and sushi.